Avril Lavigne in Make 5 Wishes Comic Book - Avril Lavigne became one of the characters in the comic book, which is a new illustrated novel from Japan. 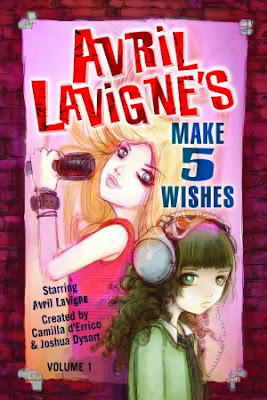 Images similar to Lavigne featured in a comic entitled Make 5 Wishes, published by Del Rey Manga, the United States. The book will be the original edition of the original book in English. In the first edition we are told that Anna, a teenager who is closed, given the opportunity to submit some requests by the devil. Then the situation became tense when he meets with the character Lavigne, who helped to defeat the devil. The first volume will be launched on April 10, 2007, while the subsequent volumes are available at comic book stores starting in July 2007.